The Japanese North China Area Army estimated the strength of communist regulars to be about 88,000 in December 1939. Two years later, they revised the estimate to 140,000. On the eve of the battle, the Communist forces grew to 400,000 men strong, in 115 regiments. The extraordinary success and expansion of the Eighth Route Army against the Japanese had Zhu De and the rest of the military leadership hoping that they could engage the Japanese army and win. By 1940, growth was so impressive that Zhu De ordered a coordinated offensive by most of the communist regulars (46 regiments from the 115th Division, 47 from the 129th, and 22 from the 120th) against the Japanese-held cities and the railway lines linking them. 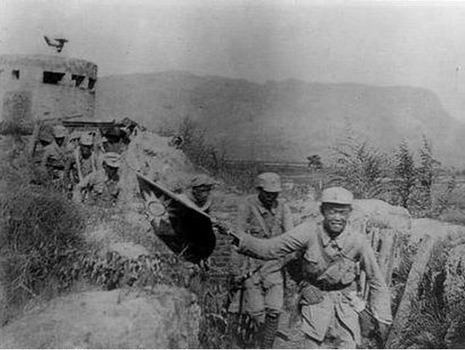 From 20 August to 10 September, communist forces attacked the railway line that separated the communist base areas, chiefly those from Dezhou to Shijiazhuang in Hebei, Shijiazhuang to Taiyuan in central Shanxi, and Taiyuan to Datong in northern Shanxi. They succeeded in blowing up bridges and tunnels and ripping up track, and went on for the rest of September to attack Japanese garrisons frontally. About six hundred miles of railways were destroyed and the Chingching coal mine, which was important to the Japanese war industry, was rendered inoperative for six months. It was the greatest victory the CCP fought and won during the war. The Hundred Regiments offensive persuaded the commuist military high command that they were no match for the Imperial Army. When General Okamura Yasuji took command of the North China Area Army in the summer, the new approach was "Three All" meaning kill all, burn all, and destroy all in those areas containing communist forces. The population of the communist base areas dropped dramatically and communist operations were severely limited. Mao used the subsequent rectification campaign to reassert his personal authority over the party and over military strategy, and this meant the abandonment for the rest of the war of any serious communist challenge to the Japanese position in North China.